Our General Collections house materials for adults, both fiction and non-fiction. We also have movies and magazines. 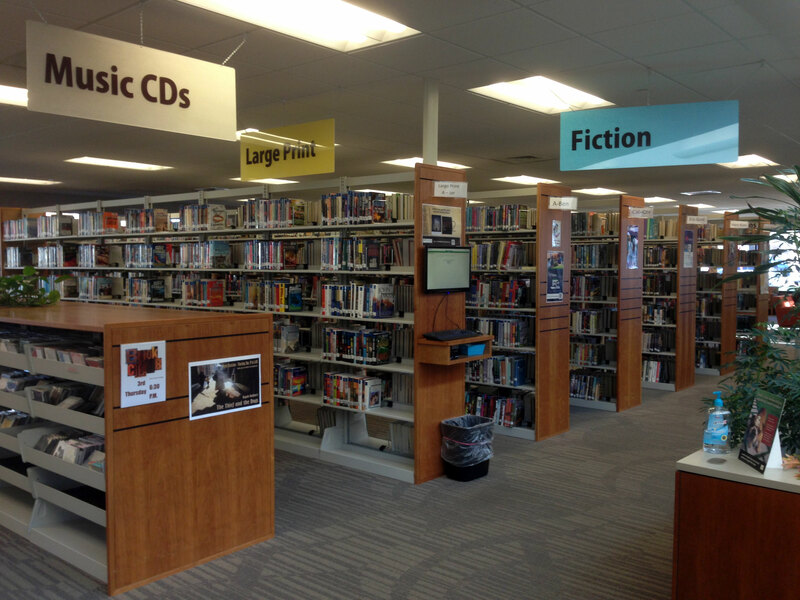 The books in the Adult Fiction section of the library are targeted primarily for audiences aged 18 years and older. Fiction describes people, places, events, or narratives derived from imagination in addition to, or rather than, solely from history or fact. All genres (types of books) can be found in the adult fiction such as mysteries, historical fiction, fantasy, thrillers, romance, science fiction, horror, westerns, and Christian fiction. Readers will find something to satisfy every taste varying from the old favorites to the new best sellers. Audio CDs and large print books are also available. At the beginning of the general fiction section are our books in large print. 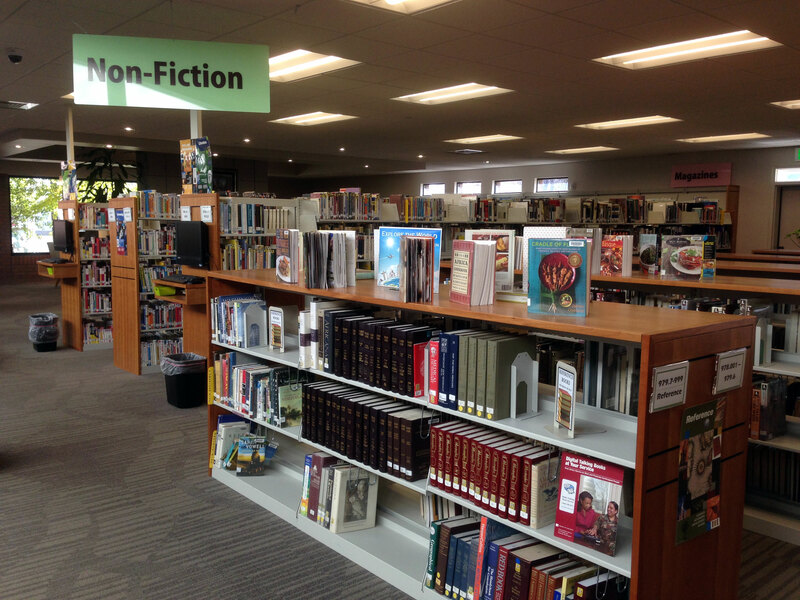 You can find both fiction and non-fiction here. Magazine for adults are located behind the Non-fiction books by the fireplace. Young adult magazines are to the west of the window in the YA section. Children’s magazines are to the east of the Children’s gaming computers in the Junior section. Real life is what non-fiction is all about. If you head through the hall into the general area and veer to the right, the possibilities are vast. We have an entire wall dedicated to biographies, another full of cookbooks of all kinds. If you’d like to try knitting, building a canoe, reading palms, balancing your budget, planning a vacation, or helping your child with math, visit the non-fiction collection. Snuggled within the non-fiction collection are a growing number of books in foreign languages. If you’re interested in reading Les Miserables in the original French, looking for a steamy romance in German, or perhaps a gripping Spanish detective story, check out the 400s in the general non-fiction section. We also have titles in other languages in the Young Adult non-fiction and the junior non-fiction sections, also under the 400s. Check out books like The Hunger Games, the Twilight series, Harry Potter, or the Magic Tree House. If you head through the hallway into the general area, you’ll find immediately on your left sets of glassed in and locked cases containing the most valuable and rare books in our library. While these books can’t be checked out, they can be looked at here in the library. Just give the reference librarian something as collateral (a driver’s license, phone etc. will suffice) and let them know which titled you’re interested in. They will retrieve the item and let you read away at one of the tables nearby. Looking for some down-home recipes or something wildly exotic? We’ve got both and everything in between; baking, trail food, beverages, dehydrating, and more. To find the Cookbooks, go through the hallway into the general collection and turn right. You’ll find them on the far wall. We have a vast array of Biographies for you to explore; world leaders, athletes, music icons, humanitarians, and more. To find Biographies, go through the hallway and make a U-turn to the right. You’ll find a whole wall covered with them. Biographies are alphabetized by the last name of the person they’re about unless they’re about a group of people. Those books will be under BIO-Group and alphabetized under the author’s name. Looking for a good story told through sequential art? Check out our Adult Graphic Novels. To find them, head through the hallway into the General Collection. If you veer to the left and pass by our Fiction section, you’ll find Adult Comics and Graphic Novels in the back left corner. The library has an extensive collection of DVDs. They are located on the north side of the main foyer, just in front of the Young Adult section. DVDs that have been released in the theater are located in these bins. Both feature films and documentaries are included here. Ratings are indicated on the front of each DVD case, so that you can choose the movies best suited for yourself and your family. We are also building our Blu-ray collection, and they are located in bins on top of the DVD display case. We have a few VHS tapes as well, and they are located in the far northeast corner of the General section. If you walk down the General hallway, to your left on the wall next to the Fiction section (the North wall), you will find our collection of audiobooks on CD and cassette, including both fiction and non-fiction. We also have Junior CDs (with Light Green labels). They are housed in the Junior section, on the north wall.